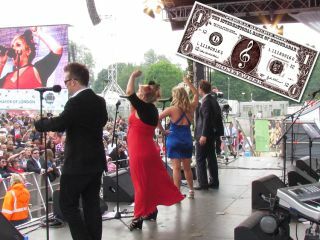 Money Week on MusicRadar has already bought you a foolproof guide to making money from your function/covers band. Now we bring you the wisdom of a musician who recently played one of the biggest function-band gigs of all time - Sera Golding of MIB, who played at the Royal Wedding party in London's Hyde Park to 300,000-plus people on 29 April 2011. So what was that like? "It was just awesome. I'm still struggling to construct a full sentence about it… it was just the absolute ultimate dream gig. Playing to 300,000 people was just amazing. I was so proud. The main thing that will always stay with me was how great the guys in the band were. "It would've been very easy to let nerves get the better of them and to have started off a bit sheepishly… but no, that first chord of the first song came in stronger than I ever could have imagined. Gone were any nerves ­- we just had an absolute blast and enjoyed every minute of it. It just made me realise I am very lucky to get play with such talented musicians!" 1. Design your setlist to suit the audience, and put yourself in the position of the audience and client when choosing your setlist. Remember they are paying you to play, so suddenly you have to change your perspective around - instead of playing for yourself, you're playing for them. 2. Take your marketing very seriously. Remember the client or agent has no idea who you are, or what you play like, and subliminally they'll make up their mind within a split-second of looking at your website/picture/logo, so your marketing needs to represent you as a band perfectly. 3. The people you work with/play with are so important! I've met a lot of band leaders who have that 'everyone is replaceable' attitude, and yes, you can replace anyone with a great dep. But having a fantastic team of musicians that you work with who are all on the same page is really important. You're going to be spending a lot of time together, so getting on like a house on fire is really important, and will show in your onstage chemistry. 4. Be 100 percent reliable. If someone is ill, find a replacement. If your car breaks down, find another way to get there. Musicians have an awful reputation for being unreliable, and proving you're not like that will win you a lot of respect and work. 5. Love what you do! If you're just doing this for the money then don't bother. It's easier just to get a job and focus on your own music. It's hard work running a function band: running the admin side is really a full-time job during the week, then there's a lot of travelling, a lot of waiting around, late nights and a lot of lugging of heavy gear! You also need to be prepared to give up your whole weekend. You have really got to love it. If you love what you do, people will see that. And that's what makes a great band!